their N-termini, indicative of proteins that bind SH3-domain-containing proteins (O'Connell et al. 1996; McPhee et al. 1999). SH3 domains are found in various families of proteins, including adaptor proteins, cytoskeletal proteins and various signal transduction proteins, such as the SRC family tyrosyl kinases (Pawson and Gish 1992; Terasawa et al. 1994). These proteins are distinct self-folding proteins that are generally thought to confer protein-protein interactions (Cowan-Jacob 2006). The N-terminal region of PDE4A5 was shown to be responsible for its binding to a number of members of the SRC-tyrosyl kinase family (O'Connell et al. 1996). In contrast, however, the binding of PDE4A4 to these same SH3-domain-containing proteins could not be explained purely by an interaction with the N-terminal region; instead, an additional proline-rich region located between UCR2 and the catalytic region, namely LR2, was found to be necessary both for the correct localization of the enzyme and also for its interaction with LYN-SH3 (McPhee et al. 1999). In addition, the interaction of PDE4A4 with LYN-SH3 was shown to be pivotal to the change in conformation of PDE4A4 and the resultant increase in sensitivity to rolipram seen in the particulate fraction of the enzyme in previous studies (McPhee et al. 1999). In the case of PDE4A5, deletion of the defined SH3-binding region was, in itself, insufficient to cause complete loss of intracellular targeting of the enzyme. Indeed, it was shown that multiple regions within the N-terminal non-catalytic region of PDE4A5 contribute to its intracellular targeting (Beard et al. 2002). Further studies examining the interaction of PDE4s to SH3-domain-containing proteins in brain revealed a third isoform able to bind SRC-family tyrosyl kinases. This study revealed PDE4D4 to bind with equal affinity to LYN, FYN and SRC, suggesting a subfamily specificity in the ability of PDE4s to bind SRC-family tyrosyl kinases (Beard et al. 1999). Further information as to the functional role of protein-protein interactions in controlling subcellular localizations of PDE4s and thus regulation of cAMP microdomains is demonstrated by the action of caspase3 on PDE4A5. In mammals, various stimuli of apoptosis lead to the activation of a family of cysteine proteases with specificity for aspartic acid residues, referred to as caspases (Thornberry et al. 1992). Caspases exist as zygomens until proteolytically activated, either auto-catalytically or by other caspases (reviewed in Nagata 1997). Caspase activation is induced by a wide array of death signals and leads to precipitous cleavage of protein substrates, thereby disabling important cellular processes and breaking down structural components of the cell. The ubiquitously expressed caspase 3 (CPP32/Yama/ apopain) is implicated as a downstream effector protease of this cascade (Fernandes-Alnemri et al. 1994). Our laboratory has identified the rat homologue of long-form PDE4A, PDE4A5, as a target of caspase-3 cleavage (Huston et al. 2000). This cleavage occurs at the motif, DAVD, which is unique to the N-terminal region of PDE4A5, and is induced both in rat-1 fibroblast cells, by the apoptotic agent staurosporine, and in rat neuronal-like PC12 cells, by withdrawal of NGF (Huston et al. 2000). The cleavage of PDE4A5 by caspase-3 leads to a loss in the ability of PDE4A5 to bind to SH3-domain-containing proteins. Cleavage also leads to a change in the intracellular localization of PDE4A5. The perinuclear localization of the full-length protein that has been shown to co-localize with the SH3-domain-containing protein, LYN, is replaced, in the cleaved product, by a distribution throughout the cytosol of the cell (Huston et al. 2000). Thus, cleavage of PDE4A5 by caspase-3 removes the ability of the protein to bind to SH3-domain-containing proteins and causes relocalization of PDE4A5; this could potentially lead to changes in the local concentration of cAMP. The significance of this is profound when the reported importance of cAMP in the control of apoptosis is considered. The second messenger has been found to mediate apoptotic signals in a wide variety of cells, augmenting or inhibiting apoptosis depending on the cell type examined (McConkey et al. 1990; Lomo et al. 1995; Kim and Lerner 1998). Indeed, in a number of studies PDE4 inhibition itself has been implicated in the induction of apoptosis (for review, see Lerner and Epstein 2006). That over-expression of PDE4A5 protects RAT1 fibroblasts against staurosporine-induced apoptosis, whereas over-expression of PDE4A8, which exhibits a subcellular distribution similar to the cleaved PDE4A5 in both COS cells and rat-1 fibroblasts, does not (Huston et al. 2000), would suggest the importance of the localization of PDE4A isoforms in modulation of the apoptotic pathway. A further example of the potential of PDE4s to interact with signaling complexes is illustrated by the ability of PDE4A5 to interact with XAP2. XAP2 (hepatitis-B virus x-associated, also known as ARA9 or AIP) was identified in 1996 as part of the FKB52 class of immunophilins due to its structural similarity to these proteins (Carver and Bradfield 1997; Ma and Whitlock 1997; Petrulis and Perdew 2002). However, despite sharing some sequence homology in its tetratricopeptide repeat (TPR) motif, a motif typical of proteins that interact with hsp90 proteins, XAP2 does not bind immunosuppressive drugs such as cyclosporin, FK506 or rapamycin, another typical characteristic of immunophilins (Carver and Bradfield 1997). XAP2 was first identified as part of the aryl hydrocarbon receptor (AhR) complex via yeast-2-hybrid and direct immunoprecipitation experiments in mouse (Kuzhandaivelu et al. 1996). Its function within this complex has been much studied, with many suggesting a role in the subcellular localization of AhR. Others suggest that overexpression of XAP2 leads to an increase in the cellular levels of AhR and also an increase in AhRmediated gene induction (Meyer et al. 2000), and this has recently been suggested to occur as a consequence of XAP2 acting to stabilize the AhR by protecting it from ubiquitination by the carboxyl terminus of hsc70-interacting protein (CHIP) ubiquitin ligase (Lees et al. 2003; Morales and Perdew 2007). The AhR is of great therapeutic interest due to its activation by tobacco smoke, which has been shown to lead to the generation of pro-inflammatory mediators from fibroblasts (Martey et al. 2005). In addition, the AhR has been shown to bind to the carcinogen TCDD, exposure to which has been implicated in COPD and lung cancer (Martinez et al. 2002). The work of Bolger et al. (2003b) identified a novel binding partner of XAP2 in PDE4A5. Immunophillins closely related to XAP2, the AIPL1 protein, FKBP51 or FKBP52 show no binding to PDE4A5, suggesting the binding of XAP2 to PDE4A5 to be exclusive. Within the sequence of XAP2, it was found that it was a TPR domain located within the carboxy half of the protein that was important for PDE4A5 binding (Bolger et al. 2003b). The TPR regions of many proteins have been shown to mediate their interaction with other proteins; indeed, hsp90 has been shown to bind the TPR regions of a number of proteins, including XAP2 (Sikorski et al. 1990; Uzawa et al. 1990). The authors (Bolger et al. 2003b) suggest that, as it is only PDE4A5 within the vast array of members of the PDE4 family that can bind XAP2, the unique N-terminal region of PDE4A5 must be involved in the interaction. However, this study also implicated a second site located within the UCR2 region of PDE4A5. Here, an EELD motif similar to that in the XAP2 binding region of hsp90 was shown by mutational analysis to bind XAP2 (Bolger et al. 2003b). In addition to the binding of XAP2, this region has been shown to be important in the interaction of UCR1 and UCR2 regions of PDE4D3, and the region has also been implicated in the ability of PDE4D isoforms to dimerize (Beard et al. 2000; Richter and Conti 2002), which suggests that when proteins interact with PDE4 isoforms, they stabilize the monomelic forms. This would presumably prevent complex oligomers forming thereby ensuring the fidelity of interaction between a particular PDE4 molecule and a single scaffold species. This UCR2 region is conserved within all PDE4 isoforms and so cannot account for the specificity of XAP2 binding to the PDE4A5 isoform, implying a role for the isoform-specific N-terminal region. The binding of PDE4A5 to XAP2 was found to have a number of functional consequences (Bolger et al. 2003b). Following binding of XAP2, the activity of PDE4A5 was severely inhibited; this would presumably modulate the cAMP concentration around the locale of XAP2. In addition, binding of the two proteins was shown to greatly increase the sensitivity of PDE4A5 to its cognitive inhibitor rol-ipram. Both of these functional consequences suggest that a conformational change in the catalytic region of PDE4A5 takes place as a result of XAP2 binding. Binding of XAP2 to PDE4A5 also culminates in the attenuation of the ability of PDE4A5 to be phosphorylated by PKA. Phosphorylation of PDE4A5 by PKA acts to increase the activity of the enzyme (MacKenzie et al. 2002). However, it appears that this action is independent of the ability of the inhibition of the enzymatic activity of PDE4A5 by binding of XAP2 (Bolger et al. 2003b). Although binding of PDE4A5 to XAP2 was shown to have a number of functional outcomes for the PDE4A5 enzyme, it remains to be seen whether reciprocal functional outcomes can be identified for XAP2. It is interesting to note that recently it has been suggested that an environment of high cAMP causes the nuclear translocation of the AhR receptor (Oesch-Bartlomowicz and Oesch 1990; Bock and Kohle 2006), itself a PKA target (Dolwick et al. 1993), with consequences for its protein-protein interactions. It will be of interest to investigate whether binding of PDE4A5 to XAP2, which is a well-defined binding partner of the AhR, has further functional consequences. A number of genetic and neuropsychiatrie studies have suggested that mutations with Disrupted in schizophrenia 1 (DISC1) gene lead to a predisposition to schizophrenia and related psychological disorders (reviewed in Carter 2006; Hennah et al. 2006; Porteous and Millar 2006). DISC1 is expressed exclusively in brain and has a structure that is consistent with structural scaffolding proteins. As such, the search for interacting partners of this protein has been wide. One such study identified various partners of DISC1, including the neurodevelopmental proteins, FEZ1 and NDEL1, and also identified an interaction between DISC1 and PDE4B (Millar et al. 2003). PDE4s have long been implicated in functions of the CNS (Zhang and O'Donnell 2007). Mutations in the dunce gene of Drosophila, the homologue of human PDE4, were shown to effect learning and memory (Davis et al. 1995). In addition, early studies on the prototypical PDE4 inhibitor, rolipram, showed its potential for treating depression and diseases of cognitive impairment (Zhu et al. 2001). However, severe challenges in the development of therapeutic agents have become apparent due to an incomplete understanding of the function and regulation of PDE4s in the brain. The identification of specific interactions of PDE4 family members with neuronally functional proteins allows an increase in the understanding of PDE4 function within the CNS. Co-immunoprecipitation and co-localization studies in various cell types verified the original yeast-2-hybrid data showing interaction of DISC1 with PDE4B. Further analysis revealed that interaction of the two proteins was achieved via the amino terminal end of DISC1 and the UCR2 region of PDE4B. The UCR2 region of PDE4s is highly conserved between all family members, and as such it was revealed that DISC1 was able to bind to members of all four of the PDE4 gene families (Millar et al. 2005). More recently, however, further binding sites for DISC1 within PDE4s have been found that may modulate and regulate the interaction of specific PDE4s to DISC1 (Murdoch et al. 2007). Phosphorylation of PDE4B1 by PKA in response to increases in local cAMP levels causes release of PDE4B1 from DISC1, suggesting a dynamic interrelationship between the two proteins (Millar et al. 2005). In addition to biochemical data, genetic relevance to this interaction was implied by the finding that cousins suffering from schizophrenia and psychotic illness presented a disruption in the gene encoding PDE4B. When patient-derived lymphob-lastomal cells were examined, it was shown that this translocation led to a dramatic decrease in the protein expression of PDE4B1 (Millar et al. 2005). The discovery that chromosomal disruptions in both the DISC1 and PDE4B genes are independent risk factors in schizophrenia and that these two proteins interact to modulate cAMP signaling is of potential therapeutic significance. Further definition of the molecular basis of the DISC1/PDE4B relationship will be of great value in developing this therapeutic potential. P-arrestins are signaling scaffold proteins that have a number of cellular functions, including the desensitization of GPCRs such as the P2-adrenergic receptor (P2AR). In the classic paradigm of receptor desensitization, agonist-occupied and activated P2AR couples to Gs, leading to the activation of membrane-bound adenylyl cyclases (ACs) and generation of cAMP (Hall 2004). This process is rapidly desensitized when G-protein-coupled receptor kinases (GRKs) phosphorylate the activated P2AR, which promotes the recruitment of cytosolic P-arrestins to the plasma membrane and thus uncouples the further interaction between P2AR and Gs (Luttrell and Lefkowitz 2002). Recent studies add a new facet of P-arrestin function to this P2AR desensitization process, as P-arrestin has been shown to form a complex with PDE4 enzymes (Perry et al. 2002). This provides a means of delivering a cAMP-degrading enzyme to the site of cAMP synthesis and quenching the existing cAMP at the plasma membrane in an agonist-dependent manner. P-Arrestins therefore play a dual role in resetting cAMP levels after agonist stimulation by preventing further AC stimulation and, additionally, recruiting PDE4 to mop up excess cAMP. The transient rise in cAMP affected by receptor stimulation results in activation of locally tethered PKA that in turn leads to phosphorylation of PKA substrates in the local environment, one of which is the P2AR itself. PKA phosphorylation of the P2AR allows it to switch its coupling from Gs to the inhibitory guanine nucleotide regulatory protein, Gi. This switch inhibits AC activity and instead couples the P2AR to activation of ERK1 and ERK2 via a pathway involving SRC, Ras and Raf (Daaka et al. 1997). Thus, by controlling the levels of cAMP at the plasma membrane, P-arrestin-recruited PDE4 regulates the PKA-mediated switching of the P2AR between Gs-mediated activation of AC and Gi-mediated activation of the ERK signaling pathway (Baillie et al. 2003). All PDE4 isoenzymes are capable of binding P-arrestin1 and 2, independent of agonist treatment, through a common site located within their conserved catalytic domain (Perry et al. 2002; Bolger et al. 2003a). However, studies in a number of cell types indicated that the PDE4D5 was the isoform predominantly or exclusively found in association with P-arrestin and recruited to the P2AR on agonist stimulation, even when it was expressed at a much lower level than other PDE4 isoforms (Bolger et al. 2003a). This was found to be due to an additional P-arrestin binding site in the unique N-terminal region of PDE4D5, which conferred it with a higher affinity for P-arrestin than other PDE4s (Bolger et al. 2003a). Subsequent peptide array analyses (see Sect. 3.1) defined the P-arrestin2 binding sites on PDE4D5 in more detail (Fig. 4) (Bolger et al. 2006). Efforts to map the PDE4D5 binding sites on P-arrestin2 defined two regions that are necessary for the interaction, one located at the extreme N-terminal end of the N-domain of P-arrestin2 and the other within the C-terminal C-domain (Bolger et al. 2006). Again, peptide array analyses were utilized to confirm and expand these data, revealing that the binding site in the N-domain of P-arrestin2 interacts with the common PDE4 catalytic unit, while two distinct sites in the N-domain confer specificity for PDE4D5 (Baillie et al. 2007). Interaction of PDE4D5 with both the N- and C-domains of P-arrestin2 was demonstrated to be necessary for regulation of the P2AR (see Sect. 3.1). Fig. 4 A schematic diagram showing the respective binding sites of P-arrestin and RACK1 on PDE4D5, illustrating the powerful advance of peptide array technology. Within the N-terminal region, which is unique to PDE4D5, both P-arrestin and RACK1 compete for the same binding site. Within the C-terminal region, which is common to all PDE4D isoforms, distinct binding sites for P-arrestin and RACK1 have been identified. Peptide array scans, which were used to identify these binding regions, are shown. In these the sequence of PDE4D5 was used to generate a library of overlapping 25-mer peptides, each shifted by five amino acids, immobilized on nitrocellulose. The peptide blots were then probed with tagged, recombinant P-arrestin or RACK1 as indicated. Dark spots indicate peptides that may contribute to the binding site. These sites are then verified by each of the positive spots being used as a template to design peptide arrays in which each of the amino acids is sequentially mutated, usually to alanine. These are then probed with the corresponding tagged, recombinant proteins, and substitutions that lead to loss of binding indicate critical interacting residues importance of P-arrestin in recruiting and tethering PDE4D5 to the P2AR was demonstrated by a dominant negative approach whereby catalytically inactive PDE4D5 was over-expressed in both HEK293B2 cells (Lynch et al. 2005) and cardiac myocytes (Baillie et al. 2003). As shown in Fig. 5, this species exerted a dominant negative effect by binding to P-arrestin and displacing the active endogenous PDE4D5 from the P2AR signaling complex and potentiating agonist-stimulated ERK activation by its failure to degrade local cAMP. However, this dominant negative effect was abolished when a point mutation was made in the unique N-terminal region of catalytically inactive PDE4D5 that ablated its ability to interact with P-arrestin, thereby implying that recruitment by P-arrestin is critical to the function of PDE4D5 in these cells (Lynch et al. 2005; Bolger et al. 2006). Taken together, these studies demonstrate that a particular PDE4 isoform can exert a specific functional role within a cell and that function is critically dependent on targeting by protein-protein interaction. The interaction between PDE4D5 and P-arrestin has recently been reviewed in detail elsewhere (Baillie and Houslay 2005; Baillie et al. 2005; Bolger et al. 2007; Houslay 2007). (WD) repeat motifs, which are proposed to form a seven-bladed, P-sheet propeller structure (for modeling details, see Bolger et al. 2002), similar to the G-pro-tein P-subunit (Sondek and Siderovski 2001). This structural design provides multiple protein interaction surfaces for RACK1 to scaffold such signal transduction proteins as PKC, SRC, integrin P-subunits, the NMDA receptor and the IGF1 receptor (Ron et al. 1994; Liliental and Chang 1998; Chang et al. 2001; Hermanto et al. 2002; Yaka et al. 2002). RACK1 has been shown to be involved in various biological functions, such as the regulation of heart contraction by noradrenaline (Johnson et al. 1996), glucose-stimulated insulin secretion in pancreatic P cells (Yedovitzky et al. 1997), NMDA channel function (Thornton et al. 2004) and integration of adhesion and insulin-like growth-factor-I signaling and cell migration (Kiely et al. 2005). RACK1. A combination of yeast-two-hybrid, mutagenesis and modeling approaches demonstrated that WD-repeats 5-7 of RACK1 were sufficient for the interaction with PDE4D5 and that the important residues for interaction were all clustered on a single surface of RACK1 (Steele et al. 2001). Subsequent studies delineated the &4CK1 interaction Domain in the N-terminal region of PDE4D5, termed RAID1, which is proposed to form an amphipathic helical structure that could interact with the P-propeller blades of RACK1 in a manner analogous to the interaction of the helical Gy protein with the P-propeller protein, GP (Bolger et al. 2002). A synthetic peptide of the RAID1 region bound to RACK1 with a similar affinity to that of PDE4D5 and could also inhibit the interaction between PDE 4D5 and RACK1 in a concentration-dependent manner (Bolger et al. 2002; Smith et al. 2007). Binding of PDE4D5 to RACK1 was found not to affect its activity, but did slightly alter its sensitivity to rolipram (Yarwood et al. 1999), which may be due to the fact that peptide array analysis identified a novel binding site for RACK1 in the PDE4D catalytic unit that abuts the active site for cAMP binding (Bolger et al. 2006). The functional consequence of the RACK1/PDE4D5 interaction was not apparent until it was discovered that P-arrestin could compete with RACK1 for binding to PDE4D5 (Bolger et al. 2006; Smith et al. 2007). A combination of yeast three-hybrid and peptide array approaches (see Sect. 3.1) showed that RACK1 and P-arrestin have overlapping binding sites on the N-terminal region of PDE4D5, and they therefore interact with PDE4D5 in a mutually exclusive manner (Fig. 4). Peptide array analysis also uncovered an additional binding site for RACK1 in the catalytic region of PDE4D5, which had not been appreciated by previous approaches. Knockdown of RACK1 using siRNA (small interfering RNA) markedly increased the proportion of PDE4D5 that can associate with P-arrestin. This, in turn, increased the recruitment of PDE4D5 to the P2AR upon isoproterenol stimulation, which significantly attenuated PKA phospho-rylation of the P2AR and activation of ERK (Bolger et al. 2006; Smith et al. 2007). The interaction of RACK1 and PDE4D5 can therefore impact on P-adrenergic signaling by sequestering distinct pools of PDE4D5 such that it is unavailable to modulate the function of the P2AR. This study eloquently demonstrated that different pools of the same isoform might themselves be compartmentalized within the cell by virtue of their existence within different functional complexes. Furthermore, it underlines the importance of defining in detail the molecular basis of the proteinprotein interactions of PDE4 isoforms and demonstrates the potential to manipulate their roles within various functional complexes by disruption of their interacting domains for the development of novel drug therapies. AKAPs are a diverse family of proteins that bind to PKA regulatory (R) subunits in order to constrain PKA at various subcellular locations, where it can detect local cAMP gradients and confer the appropriate response on PKA substrates that are either within the same complex or in their close proximity. In addition to PKA and its substrates, AKAPs also scaffold an ever-growing number of other signaling proteins including other kinases such as PKC (Klauck et al. 1996), phosphodiesterases (Houslay and Adams 2003), phosphatases (Smith et al. 2006), GPCRs (Malbon et al. 2004) and G proteins (Diviani et al. 2006). 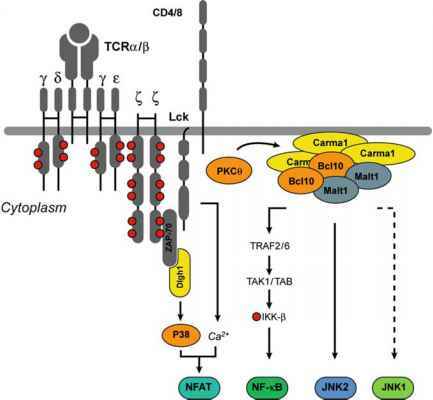 AKAPs are therefore essential elements of compartmentalized cAMP signaling that orchestrate efficient signal transduction, termination and crosstalk with other signaling pathways. The recruitment of PDE4 into these AKAP-mediated signaling complexes allows the control of local cAMP gradients, and thus the control of PKA activity within the complex. A number of PDE4 isoforms are recognized to be targeted to AKAPs, and the functional consequences of these interactions are now becoming clear (Bolger et al. 2007). PDE4D3 has been shown to specifically interact with mAKAP, an AKAP primarily found in skeletal and cardiac muscle (Dodge et al. 2001). The inclusion of a PDE4 long isoform into the mAKAP-PKA complex allows for self-regulation via negative feedback. As cAMP levels rise and mAKAP-associated PKA is activated, PDE4D3 within the same complex is consequently activated by PKA phosphoryla-tion of UCR1. This PDE4D3 activation upregulates the degradation of cAMP, which facilitates the deactivation of mAKAP-associated PKA and the subsequent dephosphorylation of PDE4D3. In such a manner, cAMP levels are reset to basal levels (Dodge et al. 2001). Truncation studies demonstrated that the mAKAP-PDE4D3 interaction is dependent upon the 15-amino-acid, unique N-terminal region of PDE4D3, which accounts for the fact that mAKAP interacts poorly with other PDE4 iso-forms (Dodge et al. 2001). This region of PDE4D3 contains a PKA consensus site at serine 13 (S13) in addition to the activating PKA site within UCR1, which is found in all PDE4 long forms. Subsequent studies showed that PKA phosphorylation of S13 in the unique region of PDE4D3 dramatically increases its interaction with mAKAP (Carlisle Michel et al. 2004). This study was the first to ascribe a function for S13 phosphorylation of PDE4D3 and went on to propose that activation of mAKAP-anchored PKA facilitates the recruitment of PDE4D3 in order to achieve faster signal termination. The mAKAP-PDE4D3 interaction also involves a central region of the mAKAP (amino acids 12861401), which is clearly distinct from the C-terminal PKA anchoring site (Dodge et al. 2001). mAKAP is known to be induced and to accumulate in the perinu-clear region in rat neonatal ventriculocytes in response to hypertrophy (Kapiloff et al. 1999). That PDE4D3 undergoes redistribution in order to colocalize with the induced mAKAP at the perinuclear region suggests that this complex may be required as cells adapt to the requirement for increased contractile power in the failing heart (Dodge et al. 2001). Scott and colleagues have recently demonstrated that ERK5 and EPAC1 are also complexed with mAKAP, PKA and PDE4D3 in rat neonatal ventriculocytes (Dodge-Kafka et al. 2005; see Sect. 2.5.8). PDE4D3 has been shown to be targeted to another AKAP, AKAP450, which allows for its tethering to PKA at the centrosomal region of testicular Sertoli cells (Tasken et al. 2001). Here, the tight regulation of PKA activity by an associated PDE might be predicted to play a role in cell cycle control. The functional significance of AKAP/PDE4 tethering has been approached using a novel dominant negative strategy (McCahill et al. 2005). In this, single point mutations in the active site of various PDE4 isoforms were made in order to render them catalytically inactive (see Sect. 3.3). These were then over-expressed in cells so as to displace the cognate endogenous active PDE4 isoforms from their cellular anchor sites, thereby raising cAMP levels in that specific locale. Such an approach has no need for knowledge of the mode of targeting of that specific isoform, but only yields a phenotype upon displacement. Doing this in COS1 cells, PDE4D3 and PDE4C2, but not PDE4A4 and PDE4B1, were proposed to gate the activation of AKAP450-tethered PKA type-II in the centrosomal region of unstim-ulated cells (McCahill et al. 2005). Additionally, these recombinant long PDE4 isoforms are able themselves to act as spatially constrained reporters for localized PKA activity by virtue of the PKA site in their UCR1 region, providing a means of gauging local cAMP action. In COS1 cells, only catalytically inactive PDE4D3 and PDE4C2 were phosphorylated by PKA in resting cells, suggesting that these species are anchored close to PKA. Catalytically inactive PDE4D3 and PDE4C2 were found to co-immunoprecipitate with AKAP450 and, additionally, phosphorylated catalytically inactive PDE4D3 and PDE4C2 colocalized with AKAP450 and PKA type-II in the centrosomal region. Taken together, these data suggest that specific endogenous PDE4 isoforms are targeted to AKAP450 at the centrosome where they tightly regulate local cAMP levels to prevent the inappropriate activation of PKA in resting cells (McCahill et al. 2005). The most recent report of a protein-protein interaction between an AKAP and a PDE4 is that of AKAP185 with PDE4D3 and/or PDE4D9 in the aquaporin-2 (AQP2)-bearing vesicles of renal principle cells (Stefan et al. 2007). In these cells, fusion of vesicles containing the AQP2 water channel with the plasma membrane increases the water permeability of the cells, which facilitates water reabsorption from the collecting duct (King et al. 2004). Shuttling of AQP2-bearing vesicles to the plasma membrane occurs upon PKA phosphorylation of AQP2, a process that is triggered by binding of antidiuretic hormone [arginine vasopressin (AVP)] to its receptor and the consequential rise in cAMP levels and PKA activity (Klussmann et al. 1999). The recent study by Stefan et al. (2007) demonstrates that AKAP185 tethers PDE4D and PKA to AQP2-bearing vesicles where the PDE4D tightly controls the basal PKA activity by hydrolysis of local cAMP. Furthermore, they show that AQP2 and PDE4D translocate to the plasma membrane in response to AVP, where PDE4D is involved in terminating cAMP-dependent water reabsorption. The AQP2-associated PDE4D migrated at 98 kDa on SDS-PAGE, which is consistent with the migration of PDE4D3, PDE4D8 and PDE4D9, but unfortunately no isoform-specific antisera were available to distinguish between these species. RT-PCR identified transcripts for PDE4D3 and PDE4D9, indicating that one or both of these isoforms is the PDE4D associated with AQP2-bearing vesicles. Peptide array analysis of a library of 25-mer peptides scanning the entire sequence of PDE4D3 with an AKAP185-GST probe revealed two regions of PDE4D3 that bind directly to AKAP185. These regions were amino acids 341-365 at the extreme N-terminal of the PDE4D catalytic unit, and 571-635 in the PDE4D sub-family-specific C-terminal region. Interaction at these two sites would suggest that all PDE4D isoforms should, potentially, be capable of interacting with AKAP185. Subsequent substitution analysis of peptides revealed that residues 353-355 (DLE) and 598-600 (FQF) are critically important for the interaction. Interestingly, the FQF motif at 598-600 also represents the ERK-specific docking site on PDE4D3 (MacKenzie et al. 2000), implying that when PDE4D3 is bound to AKAP185, it will be unable to bind ERK and so will not be subject to any down-regulation of its activity via ERK phosphorylation. Overlay of an AKAP185 peptide array with a PDE4D3-GST probe revealed four sites of interaction. Truncation analysis of AKAP185 revealed that only the most C-terminal of these sites is, seemingly, essential for the PDE4D3 binding and additionally that the N-terminal region negatively regulates the interaction. The novel compartmentalized c AMP-signaling module involving PDE4D3/9, AKAP185 and PKA offers the potential for therapeutic intervention to treat imbalances of body water homeostasis. PDE4 inhibitors have been found to increase water permeability (Stefan et al. 2007) and so could be used in instances when the receptor for AVP is non-functional, whereas disruption of the AKAP-PKA interaction may be useful to treat water retention. The ERK pathway regulates critical cellular processes including survival, proliferation and differentiation by transducing extracellular signals such as growth factors, hormones and stress (Houslay and Kolch 2000). As discussed in Sect. 2.2 above, ERK can bind to, phosphorylate and thus regulate PDE4B, PDE4C and PDE4D isoforms. In common with other authentic in vivo MAPK substrates (Sharrocks et al. 2000), the ERK phosphorylation site in the catalytic region of PDE4 isoforms is flanked by two MAPK docking sites. One of these sites, the "KIM" domain, which can be utilized by both ERK and JNK, is situated 120-150 residues N-terminal to the target serine. ERK specificity is provided by the FQF motif, situated 5-30 residues C-terminal to the target serine (MacKenzie et al. 2000; Sharrocks et al. 2000). In the PDE4 catalytic unit the KIM domain is of the sequence VETAXVTSSGVLLL and is located on an exposed P-hairpin loop, while the FQF motif resides on an exposed a-helix (Houslay and Adams 2003). Thus, both sites are well presented for interaction with ERK. Mutation of these docking sites to alanine prevented the phosphorylation of PDE4D3 by ERK both in vitro and in vivo, and also blocked the co-immunoprecipitation of ERK and PDE4D3 from cell lysates (MacKenzie et al. 2000). The functional outcome of ERK phosphorylation of PDE4 isoforms is determined by their complement of UCR modules in that long forms are drastically inhibited, short forms are activated, and super-short forms are weakly inhibited (Hoffmann et al. 1999; MacKenzie et al. 2000). PDE4 isoforms then represent a point of crosstalk between cAMP signaling and the ERK pathway. This PDE4-centered crosstalk has been demonstrated to be of physiological importance to the processes of memory and learning in the rat brain (Zhang et al. 2004) and in a model of NGF-mediated neuronal regeneration (Gao et al. 2003). ERK5 was recently found to be in a complex with mAKAP, PKA and PDE4D3 in rat neonatal ventriculocytes (see Sect. 2.5.7; Dodge-Kafka et al. 2005). Binding studies indicated that PDE4D3 is the adapter protein that connects ERK5 to the mAKAP complex. This was confirmed when an ERK binding mutant of PDE4D3, in which the KIM and FQF domains were ablated, failed to recruit ERK5 to the complex. Treatment of these cells with serum to activate ERK resulted in a 50% drop in the PDE activity of the complex, an effect that could be blocked using a MEK inhibitor, indicating that anchored ERK5 activity can inhibit anchored PDE4D3 by phosphorylation of the ERK site at serine 579 (Hoffmann et al. 1999). The cells were treated with combinations of ERK and cAMP activators and inhibitors in order to evaluate the nature of the crosstalk between cAMP and ERK signaling. Pretreatment of cells with forskolin to increase intracellular cAMP prevented activation of mAKAP-associated ERK5 by serum. However, several different PKA inhibitors failed to reverse the suppression of ERK5 by cAMP, indicating that a cAMP effector other than PKA must be involved. EPAC1, the cAMP-dependent guanine nucleotide exchange factor specific for the small G-protein Rap1 (de Rooij et al. 1998), was subsequently found to co-immunoprecipitate with the mAKAP complex, while a specific activator of EPAC was found to result in inhibition of the ERK5 activity within the complex. PDE4D3 was shown to be required to recruit EPAC1 to the mAKAP complex in HEK293 cells and was shown to interact directly with EPAC1 in vitro (Dodge-Kafka et al. 2005). The mechanism of this PDE4D3-EPAC1 interaction was not discussed in this paper; however, recent observations in our laboratory suggest that EPAC interaction is not specific to PDE4D3 because there is a common binding site on PDE4 for EPAC (M Lynch, G Baillie, M.Houslay, H Bos, unpublished data). Recent work shows that mAKAP organizes two integrated cAMP effector pathways in rat neonatal ventriculocytes, comprising PDE4D3, PKA, EPAC1 and ERK5. mAKAP determines the sub-cellular localization of the complex and tethers PDE4D3 and PKA, while PDE4D3 recruits EPAC1 and ERK5 to the complex and also plays a key regulatory role (Dodge-Kafka et al. 2005). ERK5 phosphorylation of PDE4D3 inhibits tethered PDE activity leading to a local increase in cAMP levels and subsequent activation of PKA and EPAC1. Activation of EPAC1 leads to ERK5 inhibition via a Rap1 signaling pathway. Meanwhile, activated PKA phosphorylates PDE4D3 to increases cAMP metabolism that ultimately represses the EPAC1-mediated block of ERK5. As well as being organized spatially, these signaling events appear to be regulated in a temporal fashion because PKA, PDE4D3 and EPAC1 react to different threshold levels of cAMP (Beavo and Brunton 2002). In rat neonatal ventriculocytes, this intricate mAKAP-mediated signaling complex was demonstrated to be involved in cytokine-induced cardiac hypertrophy (Dodge-Kafka et al. 2005), but similar complexes have the potential to regulate crosstalk between cAMP and ERK signaling in a wide variety of cell types. A yeast two-hybrid screen to identify new PDE4D binding partners pulled out a very large, novel protein that was subsequently named myomegalin (Verde et al. 2001). Myomegalin is a 2,324 amino acid protein that contains extensive regions of a-helix and coiled-coil structures. Other structural features include a region homologous to the ARP1-binding domain of the microtubule-associated protein, dynac-tin, and a leucine zipper identical to that in the centrosomin protein of Drosophila. Myomegalin exists as multiple isoforms with a 230-250-kDa protein found enriched in rat skeletal and cardiac muscle, while a 62-kDa isoform was found only in rat testis. Myomegalin transcripts have also been detected at low levels in all cells studied including brain, lung and liver. PDE4D3 was demonstrated to colocalize with myomegalin in the Z band of the sarcomere and in the Golgi/centrosomal region of the testes (Verde et al. 2001). In cells co-transfected with myomegalin and PDE4D3, the two proteins were found to co-immunoprecipitate, co-localize at the golgi/centrosomal region, and myomegalin could also target PDE4D3 to the partic-ulate fraction (Verde et al. 2001). The authors propose that myomegalin acts as a scaffold protein that tethers PDE4D3 in order to control local PKA activity (Verde et al. 2001). Yeast two hybrid analysis indicated that myomegalin interacts with the UCR2 region of PDE4D. Consistent with this, PDE4D3 and PDE4D2 could co-immunoprecipitate with myomegalin from the lysates of transfected COS7 cells, whereas the PDE4D1 short form failed to interact. It appears then that myomegalin interacts with certain PDE4D isoforms and targets them to specific subcellular locations. The fact that myomegalin interacts with the UCR2 regulatory domain means that myomegalin may interact with isoforms from other PDE4 families, which is an avenue of investigation that would be interesting to pursue.